When a band like Switchfoot enter the party, everyone at the party swirls their head to see them make their entrance, and with this album they really make another big entrance. Welcome back Switchfoot, you have been missed. Read More When a band like Switchfoot enter the party, everyone at the party swirls their head to see them make their entrance, and with this album they really make another big entrance. Welcome back Switchfoot, you have been missed. So, 'Where The Light Shines Through' is the band's 10th album. Wow. I remember discussing with my brother in law recently what our favorite Switchfoot album was and we both came up with different albums for different reasons. When I was pushed I said 'The Beautiful Letdown' was the overall best in my opinion, but I also have a big fondness for 'Oh Gravity' as an album,I love many tracks off 'Hello Hurricane' and love the sound of 'Vice Verses'. He loved the early albums and his 5 year old son said 'Nothing Is Sound' was their best. Funnily enough you can't disagree with any of the answer, it just goes to prove we all love Switchfoot for many different reasons. So where does this album sit in my list of favorites? Well the proof for me was that I was enjoying listening to the music after writing the review notes. I was enjoying listening to the songs over and over again. I was humming the songs as I walked around, repeating lyrics as I worked, and whistling melody lines as I sat and watched the world go by with a coffee. 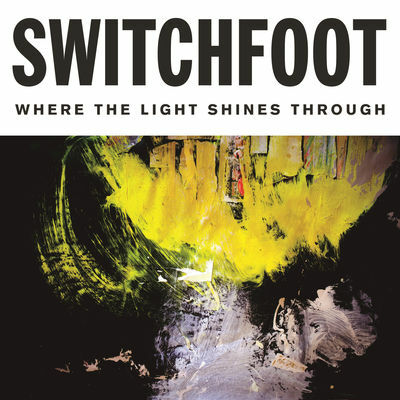 Where The Light Shines Through is Switchfoot back to their best, but also a Switchfoot album that doesn't sound like anything else they have ever made before. The band have mixed together quality rock music with a wave of fresh modern sounds without sounding like everyone else. They have managed to talk about topics that are important now but without coming across as having all the answers. It goes without saying the songs are fantastic. I love the song 'The Day That I Found God', it might be the most honest or at least the most refreshing lyrics about bowing down to God in the madness of the world we live in. 'I Won't Let You Go' could be one of my favorite Swtichfoot tracks ever. Imagine this song being played in a film as a montage, the highs and lows of life with the main character at the front, crying, smiling, hurting, dancing and running, this song will work well with that. The vocals from Jon are the sweetest I have ever heard him sing, what a tune. Just get the album for this song. Float has this groove, beat, bass line that is infectious and is a little bit Nile Rodgers, this is the modern pop rock sound of Switchfoot. Where The Light Shines Through and Shake This Feeling could have fitted on any older Switchfoot album, this is classic them. Hope Is The Anthem is exactly what the track title says, it's a song about hope in the darkness and a pretty brilliant anthem. Healer Of Souls is a classic rock n roll tune. I also have a bit of a soft spot for Bull In A China Shop, this really could have been a Beck track. I asked the question at the start, where does this album sit in my favorite Switchfoot albums? Honestly I have to admit it's up there. Will I still be playing this album in 6 months to a year time? Yes, without doubt. Classic albums don't become classics instantly, they grow into classics. Let's have this chat about is this a classic Switchfoot album in a few years time, but until then, just sit back and get into this brilliant new release from one of the biggest bands in the world. Check out the brilliant Switchfoot with a live version from New York of the track 'I Won't Let You Go'.